Welcome to Lewis Publishing Company. Since 1994 we have been actively pursuing online activites. From web site creation and web hosting to e-commerce, we continually work at expanding an Internet presence for ourselves and our customers. Catch your eye? We hope so, because we want you to understand who we are and what we can do for you and your company. It's a tough world out there, and businesses need an edge to survive. If you're small, the arrayed forces of your competition can seem overwhelming. You need an edge, a secret weapon that will help you hold your own against the superior size and financial superiority of your competition. Let Lewis Publishing give you an edge. We'll give your business a professional look, and teach you how to make the most of your resources, slipping in under your competitors' radar, and getting those elusive customers. "The conventional army loses if it does not win. Let us design and implement your web site. We work by the project, not by an inflated hourly rate. You'll know up front what it will cost you -- and we guarantee it will be less than our competition. Give us a call, or drop us an E-mail. We' d be happy to discuss your options -- no charge. Just ask for the Sergeant Major -- we'll get you into the battle, and teach you how to win the war. 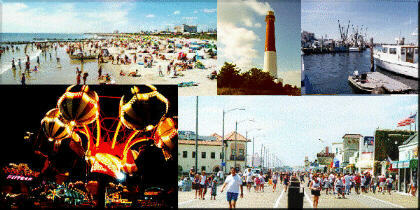 There's nothing like the New Jersey shore. to the Jersey Shore on the Internet.